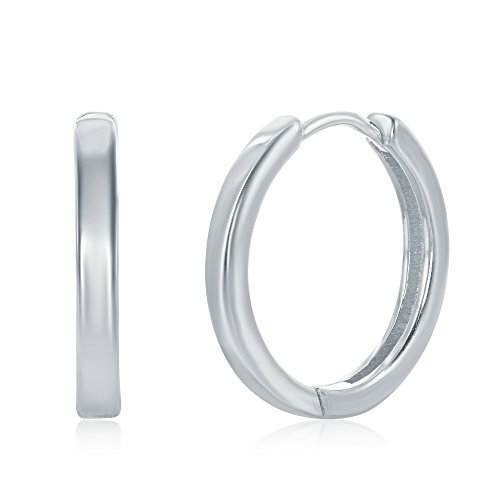 Hello Everyone, ACE LAY Presence you with your Favorite Pair of endless, continuous Hoop Earrings! They Are All You Want And More! AceLay brings you a special sterling silver pair of hoops that every woman and girl will love as a gift, it is available in different sizes & colors, affordable that will never go out of style, they are simple and have a timeless silhouette, its streamlined design makes for extremely comfortable wear, just put them in and they will stay in, Hassle free for days, no need to worry about losing one of these hoops. Nothing says "put together" like the right pair of earrings to top off your outfit. Our round hoops gives a modern twist to a classic earring with the unique design that fits snugly along your earlobe and is the perfect combination of elegance & edge! These earrings go with everything in your closet, from your day-to-day office attire, to your evening wear, from your casual workout clothes, to special occasions! • Many Size Options 20mm, 40mm, 60mm. AceLay is committed to making only the highest quality jewelry and we think of our customers' needs first. If for any reason you are not completely in love with these amazing earrings, please get in touch with one of our customer care representatives so we can make it up to you! Our clients are our number one priority. UNIQUE PRETTY DESIGN: Compared with other earrings, our unique designed hoop earrings which is available in silver and gold-tone, sizes 20, 40, and 60mm, they are surely the eye-catcher for you, it will bring you compliments whenever and wherever you go. BEST GIFT PRESENT EVER: Our stunning earrings would be the perfect and the best gift for birthday's, anniversary's, girlfriend's, wives, Christmas, Thanksgiving, Valentine's day, graduation, anniversary, birthday party, husband, lover, and friends. IRRESPECTIVE OF THEIR AGE: Men Women and Girls from all across the globe can wear these hoops every day, you can wear it to attend any special occasions, like friends dinner party, festival celebration, sweetheart's, concert, dancing ball, baby shower, engagement, wedding, Hanukah, Halloween, parade, business talks, formal events. It is helpful in a perfect image for a date with your boyfriend. FREE JEWELRY POUCH: Included in your purchase is also a free jewelry cloth so you never have to worry about sending in your jewelry to clean. SATISFACTION GUARANTEED: Your happiness is our happiness! Our return and replace policy is easy- we refund/ we replace/ we exchange. Just contact us with any questions or concerns. Our clients are our number one priority. Please search AceLay on Amazon for more of our beautiful designs.